Rochester Management, Inc. (RMI), a not-for-profit property developer and property management firm located in Rochester, New York, has been involved in the management of Brighton Towers’ apartments since their construction in the early 1970s. With providing high-quality, affordable housing at the heart of its mission, RMI was intent on planning a major renovation that would update the property and preserve it as affordable housing for seniors for many years to come. The result was a $19 million renovation financed through the New York State Housing Finance Agency, which utilized low-income housing tax credits purchased by Stratford Investment Group. The renovation included new kitchens, energy-smart appliances, common area improvements, updated fire alarm system, emergency generators and new windows for all units. In total, more than 1,000 new, high-performance units from Wausau Window and Wall Systems were installed. Wausau provided 684 units, each with a 4100i-HS Series Double Slide horizontal rolling window positioned above three lites of spandrel, and an additional 456 units with a 4100i half-slide window over one lite of spandrel. Along with the sliding window unit configurations, Wausau fabricated 152 units of 2250i Series INvent™ Series project-out awning windows over one lite of spandrel. Another 72 units of 4250i-OS Offset INvent Series windows were installed where the spandrel lites are positioned above the fixed windows. 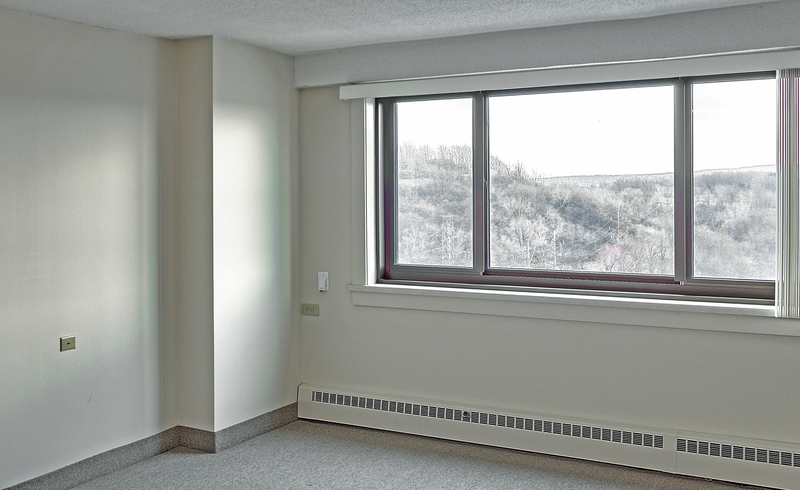 All of Wausau’s window units are constructed using extruded aluminum framing members with polyamide thermal barriers for durability and energy efficiency. Konopka specified a bronze color anodize finish to complement Brighton Towers’ beige brick exterior and to minimize maintenance. Linetec anodized nearly 69,000 square feet aluminum for the windows on this project. 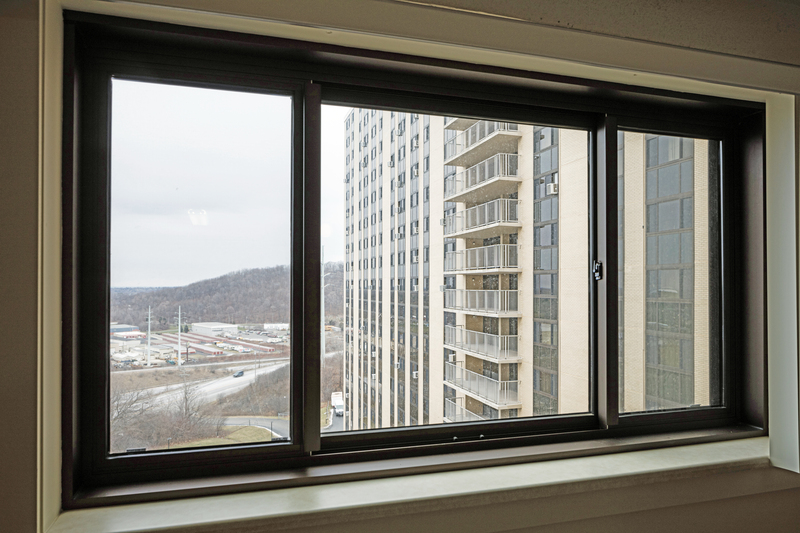 “The selected windows met Brighton Towers’ performance requirements for energy; for air, water and structural; and offered an additional improvement for sound transmission. Wind also was a key issue for this project. Wausau’s products are higher end and longer lasting than many on the market,” said Konopka. In total, Ajay Glass installed 1,365 of Wausau’s window units. All these windows are part of the Advantage by Wausau® offering to provide high-performance, pre-engineered, standard products at a competitive price and on an accelerated schedule. “We created an aggressive phasing plan that finished the entire Brighton Towers project in less than 10 months. Coordination with the subcontractors, owner and residents drove our project to success. Ajay was great to work with in the field,” said Brent Heywood, project manager with LECESSE. Guided by LECESSE, Ajay Glass completed the window replacement portion of the project in eight months, starting in Nov. 2014 and finishing in July 2015. To keep the project progressing smoothly, Ajay Glass arrived daily with approximately 20 people plus up to 10 more people from AAC Contracting environmental remediation services. On average, the team could install 12 window units each day. Extra efforts were made to minimize disruption as the building remained occupied throughout the renovation. 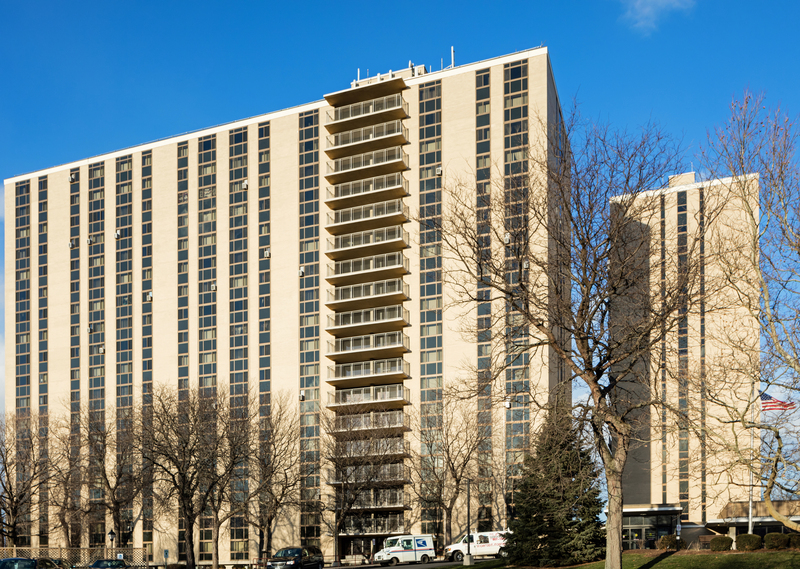 In addition to the window replacement, Brighton Towers’ renovation project included updates to the kitchens, lobby areas and the fire alarm system. All apartments include a refrigerator, an electric range, generous closet and cupboard space, and modern baths with special safety equipment. There are security access doors to the building and 24-hour emergency apartment maintenance seven days a week. With a mini grocery store, beauty salon, fitness center and wide range of activities for the residents, Brighton Towers is a community within itself. * Photos provided by: LECESSE Construction Services, courtesy of Apogee's Building Retrofit Team. Apogee Enterprises, Inc.’s Building Retrofit Strategy Team assists building owners and property managers to evaluate the benefits of window renovation and upgrades, such as improving the appearance of the building, saving energy, downsizing HVAC loading, reducing maintenance, lowering vacancy rates, increasing rental rates and enhancing the value of the building. The team offers free energy modeling, product selection and design assistance, and a network of installers covering North America. To learn more, please contact John Bendt at jbendt@apog.com, 612-790-3137, or Kevin Robbins at krobbins@apog.com, 715-409-0821. Part of Apogee Enterprises, Inc., and nationally recognized for its innovative expertise, Wausau Window and Wall Systems is an industry leader in engineering window and curtainwall systems for commercial and institutional construction applications. For more than 55 years, Wausau has worked closely with architects, building owners and contractors to realize their vision for aesthetic beauty, sustainability and lasting value, while striving to maintain the highest level of customer service, communication and overall satisfaction.